Dogs are loyal companions and have been mans best friend for centuries. In the security industry dogs have unique abilities that can be harnessed to support humans from general security to highly trained search and protection dogs. A human security officer bases many actions on sight, dogs however rely much more on their sense of smell – which is 40x greater than that of a human. Canines can detect scent from over 800 yards away. In addition to this exceptional sensory skill, they also have enhanced hearing. These two skills combined means they can pick up many things that their human partner cannot, which is particularly useful in the security industry, especially on large sites. Patrol dogs are responsible for guarding premises and large open spaces to secure perimeters against intruders. They are also trained to protect their handler. Dogs breeds which have the right characteristics to be both obedient and protective are specially selected for patrol work. Their obedience means their handler is always in control. Our licensed handlers have full knowledge of the law surrounding the use of security dogs and can demonstrate they know how to care for their dog. On completion of the required training the handler and dog must undergo a comprehensive assessment in order to gain a Level 2 General Purpose Security Certificate. The assessment must be retaken at regular intervals to ensure standards are maintained. Trained security dogs and their handlers are a proven effective solution to prevention of intruders. 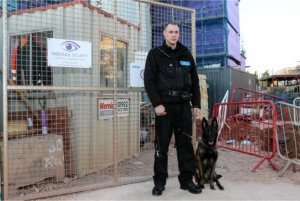 Anyone considering an act of theft or trespass will have second thoughts once they are aware a NIPTU approved dog and handler is present on site. 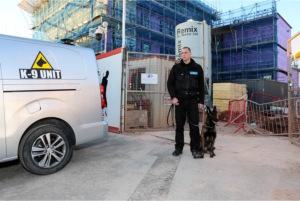 Our dogs are under the constant control of their qualified handler and industry statistics confirm that a single handler and their dog is as effective a deterrent as multiple conventional security guards. For more information please give us a call on 01392 494959 or click here to contact us.